It was a cold day but the sun was strong. 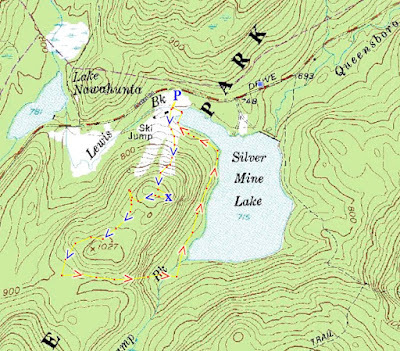 Kept on driving on 7 Lakes Drive to see if any lakes were frozen, and when we got to Silver Mine Lake (the most northern on 7 Lakes Drive) and saw it too was not fully frozen, we abandoned the idea of a frozen lake hike and just decided to hike the old abandoned ski lifts. Hiked up the steep northern lift, which was difficult because of the ice on the trail. At the top I had attempted a short bushwack to the unmarked trail which leads back down south towards the unmarked road, but once I reached this trail it was hardly discernible and totally overgrown. The trail should really be removed from the maps as it is misleading. Bushwacked towards the woods road in the valley south of Silver Mine Mountain, and then headed east towards the Menomine Trail. Heading north on the Menomine Trail along the edge of Silver Mine Lake, and headed back to the car.